Todd Jones really pissed me off last year. See, I had Guillermo Mota in my fantasy league and when he got injured, Todd Jones pitched so well that Guillermo Mota never got his closer job back. Now that Todd Jones is a free agent, should teams expect him to be the lights out pitcher he was last year? Can you say career year? 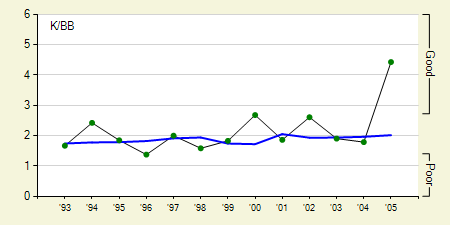 His 2005 strikeout to walk ratio (K/BB) was way out of whack with the rest of his career. It's not because he learned to strike batters out, it's because he learned how not to walk them. 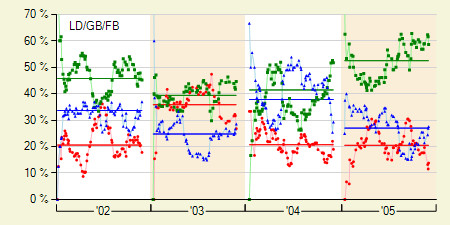 His walks per 9 innings (BB/9) were nearly 2 points lower than it was at any other point in his career. 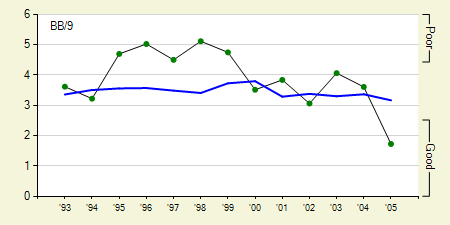 That's a drastic improvement for a veteran pitcher. In addition, he only allowed 2 home runs the entire season. This can be somewhat attributed to an increase in his ground balls induced. Even for an extreme ground ball pitcher, 2 home runs sounds more like an anomaly to me. While it seems like Todd Jones was an entirely different pitcher this year, I would approach him with extreme caution next year. A large spike after years of consistency seems extremely fluky to me. Even if his improvement was for real, there's little doubt in my mind that he'll never be quite as good as he was in 2005. We hoped you liked reading Daily Graphing – Todd Jones by David Appelman!